From Florida beaches to Lake Erie to the California Delta, algal blooms threaten human health and aquatic ecosystems. Cyanobacteria, commonly known as blue-green algae, produce toxins that can make people sick and even kill pets. In many agricultural states, millions of tons of fertilizer are applied during growing season to ensure a healthy crop. But many of these same fields lack measures needed to slow down and filter nutrients from surface water during heavy rains. Conservation practices, like buffers and grassed waterways are visible one year and gone the next, often sacrificed during commodity price shifts. Recent changes in climate suggest an increase in heavy downpours and more extended periods of above-average summer temperatures. Landscapes dominated by agriculture are ideal environments for algal blooms to thrive. Algal blooms are becoming far too common, and are impeding recreation and threatening public health all over the Corn Belt. The state of Indiana conducts regular sampling of blue-green algae (see Figure 1 below). Since 2015, sampling triggered 165 advisories, cautions or beach closures in 13 state recreation areas to protect Indiana citizens. These advisories warn boaters and swimmers to not drink the water, to shower after a swim and to keep pets out of the water. A recreation advisory is issued when 100,000 cells of cyanobacteria are detected in a milliliter of water, a guideline suggested by the World Health Organization. Figure 1. 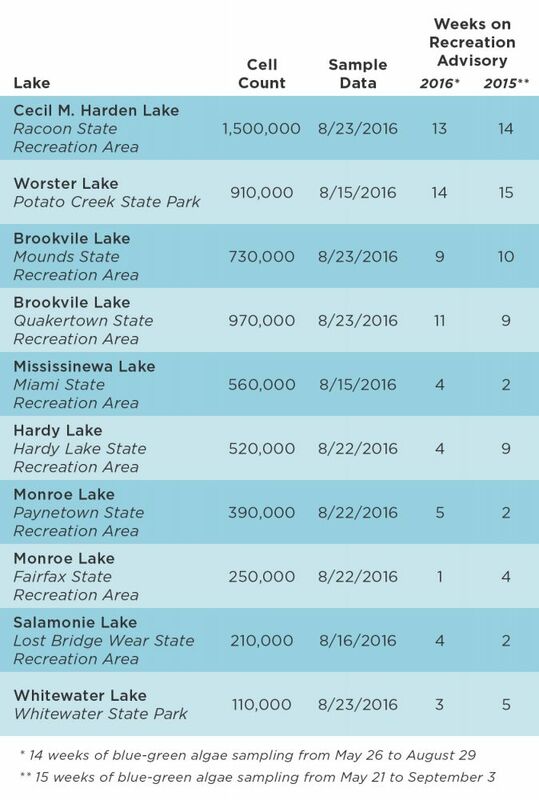 Top 10 lakes in Indiana with the highest cyanobacteria cell count. Indiana Harmful Algal Bloom Surveillance (2016). Of the 14 weeks of sampling in 2016, Worster Lake has been under an advisory the entire time and Cecil M. Harden Lake for all but one week. This pattern mirrored the 2015 sampling results. In August, four advisories were issued for Salamonie Lake (see Figure 2 below). Figure 2. Lake Salamonie is surrounded by agriculture where pollution flows into its waters, creating a prime ecosystem for cyanobacteria. Google Earth. The Iowa Department of Natural Resources monitors 39 state parks from Memorial Day through Labor Day. It issues beach warnings or closures based on the World Health Organization guidelines. Since 2006 the agency has issued 185 beach warnings, 37 of which were this year. In 2015 the Iowa agency issued 25 beach closures due to blue-green algae – a state record. Over Labor Day weekend, six beach warnings were issued. In addition to monitoring from the ground, private pilots nationwide scan for toxic algal blooms from the skies as part of NASA’s citizen-science program. Ultimately, the program hopes to develop a system of monitoring and forecasting harmful algal blooms from coast to coast. Many states lack adequate monitoring and reporting of harmful algal blooms, further exposing the public to toxic water. According to the Environmental Protection Agency, there is no federal water quality criteria or regulation for cyanobacteria. Developing a standard would create a uniform monitoring process and empower states to go above and beyond the rule. In addition, enacting a basic standard of care approach to agricultural conservation could also reduce the farm runoff that fuels algal blooms, with lasting conservation effects on which the public can depend.